This past weekend was spent indoors for the most part. It began snowing saturday morning and didn’t stop until monday night. When it’s snowing outside, I like to be baking inside. I love watching the snow fall out the window while curling up on the couch with a good cup of tea. The entire weekend the sky was a bleak grey and white as far as the eye could see. You couldn’t tell where the snow began and where it ended. But tuesday – the skies opened up into a glorious blue with sunshine across the icy horizon. It was actually warm outside, and the perfect day to go for a walk with Lainey. 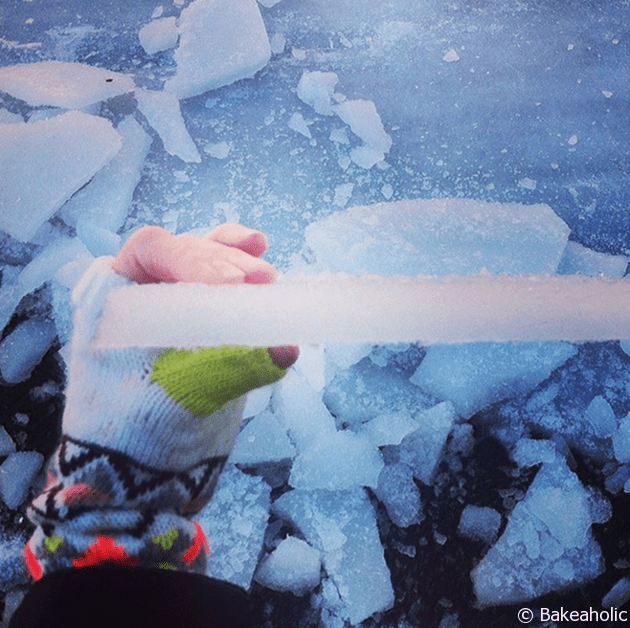 Everyone else had the same idea – take in the sunshine and get some glorious pictures of the frozen scenery. By monday night I would say we got at least a foot of snow – it came up to almost my knee when I went outside. At one point Lainey tried to venture off the ‘path’ made in the snow and plopped right into the untouched snow. She froze, unsure of what to do or where to go. It was higher than she was and couldn’t make a move. I laughed, then plucked her up and wiped the snow off her fur. She wasn’t happy about the warm bath after our walk. We also had an inch of ice on our driveway. Too bad I don’t own some skates. To warm up, I made some muffins. 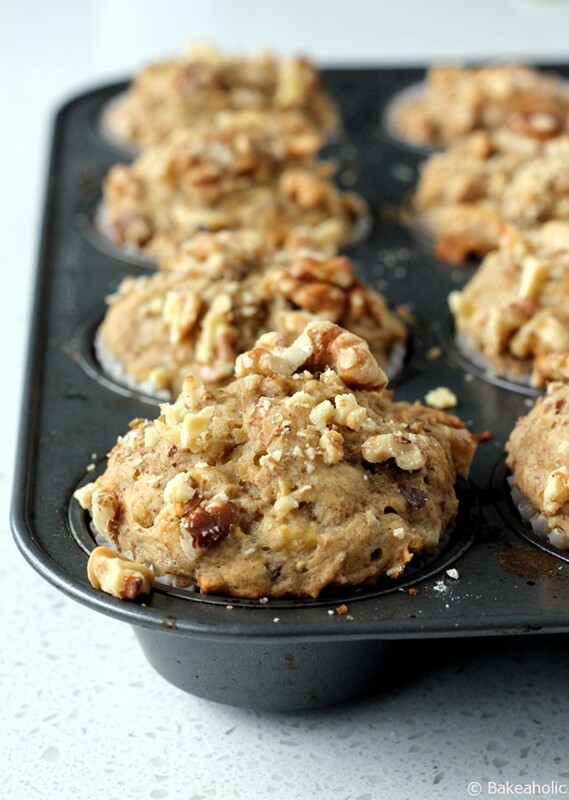 Sugar-Free, banana muffins that are warm, comforting and delicious. Even better smothered in nut butter – or sun butter. They’re great for a morning snack or afternoon treat. 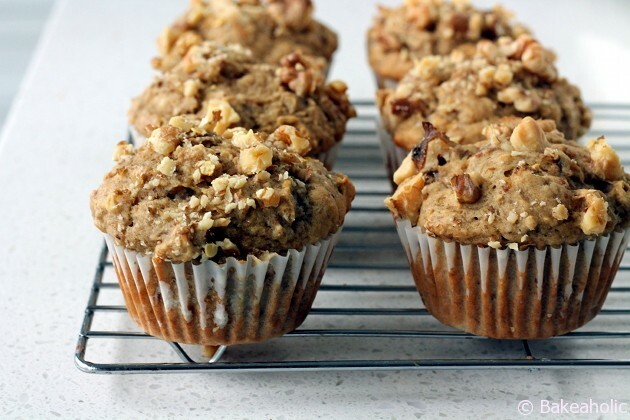 Delicious sugar-free Banana Muffins sweetened with dates, you won't even tell the difference. Prepare a 12 cup muffin pan with muffin liners. 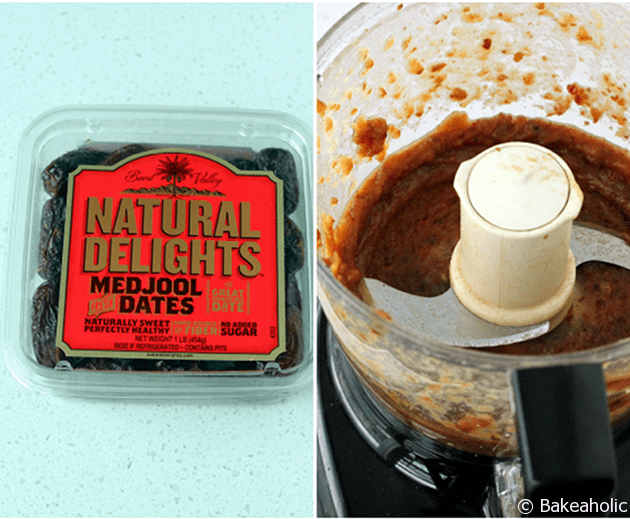 In food processor puree the dates and boiling water until thick smooth pate forms. In medium sized bowl add dates to bananas, eggs and coconut oil. Using a handheld blender mix until only small chunks of banana are left. Gently mix the dry ingredients into the wet ingredients with wooden spoon or spatula. Be careful not to over mix, fold gently. Fill muffin liners using 1/4 cup measuring cup so the liners are just about full with the mixture and top each muffin with extra chopped walnuts. I can’t believe our wonky weather. It’s like mother nature hates us! It’ll be sunny all week long and then boom, rain/snow/hail/hell on the weekend. C’mon, mother nature, be cool! At least you were able to spend a cozy day at home making these muffins. I love that they’re sugar free! I bought a pack of dates like, six months ago, thinking I was going to make all these healthy recipes (package still unopened). I need to get them out and make these muffins. Thank you for this recipe, I made them and they turned out great, they got eaten really quickly, even my sister’s partner wolfed them down and he doesn’t normally like bananas!